A couple of my girlfriends introduced me to Bahama Breeze when we were in Orlando and I fell in love with the restaurant. The food was delicious and the atmosphere was so relaxing. I was so excited when one opened up in Daytona! 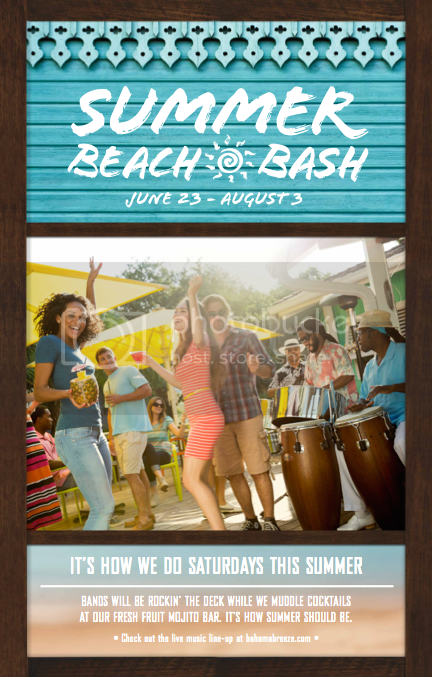 Have you heard about the new Bahama Breeze Summer Beach Bash? It’s the ultimate party with all your friends, live music and a delcious cocktails! If you’re looking for a reason to relax and catch up with friends and some fun with your spouse, head on over to Bahama Breeze. Bahama Breeze is the summer destination for good times! They feature live music that brings the sounds of the islands to their patio. They have also made a fruity signature cocktail that’s perfect for summer, the Bahama Breeze Ultimate Pineapple! Which I have personally drank and it is sooo DELICIOUS! Kick back with our Ultimate Pineapple made with Bacardi Oakheart, Coco Lopez and Myers’s Original Dark Rum, served in a freshly cut pineapple. Add friends, sip, and soak up the vibe. Saturday nights are perfect for date night or time out with your friends – it’s even better at Bahama Breeze! You get to create your own Mojito at the Mojito bar! That’s right, pick your fruit, pick your rum and watch the bartenders shake, stir and muddle your perfect cocktail! The live music is fantastic as well! Love a Selfie? You can also put those Selfie Skills to good use! Enter the #MyBBSelfie Instagram contest for a chance to win #BahamaBreeze gift cards and swag! All you have to do is share a creative selfie enjoying your time at the Summer Beach Bash and use the hashtag #MyBBSelfie and you’ll be entered for a chance to win a $25 Bahama Breeze gift card! But, hurry! Summer Beach Bash starts 6/23 and ends 8/3! Be sure to “Like” Bahama Breeze on Facebook and “Follow” on Twitter for all the latest news and info! I’ve never been but I’m in the mood for this kind of place it really looks fun a great place to loosen up a little and enjoy!